Remember Lt. John Pike and his pepper spray? 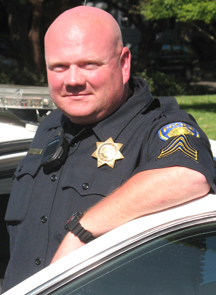 You know, the campus cop who pepper sprayed peaceful Occupy protests at the University of California Davis campus. Pike, who was suspended from his job as his pepper spraying became a meme sensation, is singled out in a new independent report released this week by the university on the events of November 18. Pike, says the report, “bears primary responsibility” for the use of the chemical. It also claims Pike used the spray incorrectly, standing much closer to his target than is recommended. Pike remains on leave, as does his supervisor, campus police chief Annette Spicuzza, but the person most significantly named in the report for her utter failure of leadership is Chancellor Linda P.B. Katehi, who is apparently getting off scot-free. The report -- which is damning to almost everyone involved -- shamelessly recommends no disciplinary action against any of the perpetrators. Katehi herself is also pretty unblushing in her announcement of the report, failing to note her responsibility or issuing any kind of apology about its conclusions. In fact, while report slams Katehi pretty hard, Cruz Reynoso, the former California Supreme Court Justice who oversaw the task force that produced it, has inexplicably come out in support of Katehi’s retention as chancellor. "She should not resign. The balance is that she has done a lot of good despite this drastic poor judgement,” he told the Sacramento Bee. Except that this “drastic poor judgement” undermines any possible moral authority for any future engagement with student dissent. It doesn’t matter what else she has done. Moreover, by letting Katehi off, the university once more lays the full blame for a failure of leadership at the top on the fools on the bottom who executed the orders, Pike and Spicuzza. Honestly, unless Katehi is sanctioned in some way, then give Pike and Spicuzza their jobs back. For a look at the full report, click here.